With solar photovoltaic (PV) arrays, whether on a homeowner’s roof or spread across acres in a utility installation, it’s the panels that get most of the attention. However, it’s the racks, conductors, overcurrent protective devices and other “balance-of-system” equipment that now is more significant in a project’s total cost. As this category continues to grow, standards organizations and manufacturers are paying more attention to the specific needs of PV installations to develop products designed to meet the unique challenges they present. A primary characteristic of PV direct current (dc) power production is that it can vary as clouds pass by and outside temperature shifts. Even when short-circuited, however, individual panels and their conductors face limited current exposure. Note that this risk multiplies as multiple panel strings are connected and combined into larger arrays. In contrast, utility systems work with alternating current (ac), with the utility grid as the source of overloads or fault currents. Obviously, the potential current exposure here is much higher, but irregularities are easier to detect because standard operating conditions are more consistent. Manufacturers are addressing the specific challenges faced by PV overcurrent protection devices with fuses engineered to withstand continuous temperature and current cycling. Both the International Electrotechnical Commission and Underwriters Laboratories have established standards requiring these products provide a low minimum breaking capacity of just 1.35 times the fuse’s rated current value. These provisions ensure circuits are opened before low fault current conditions can cascade and create threatening upstream conditions. 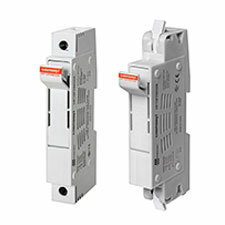 And, beyond the fuses, themselves, fuse holders are being designed to meet special requirements of the largest utility-scale installations, featuring the same finger-safe, rotating-fuse operation contractors have become used to in ac operations.